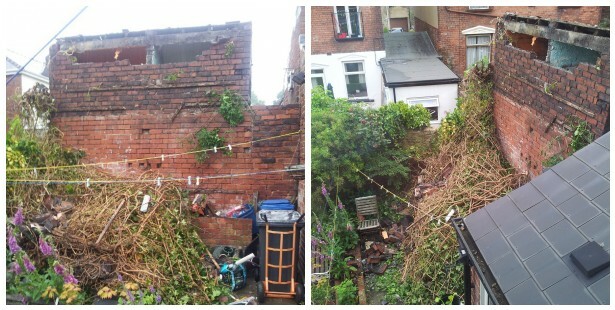 My almost ready to pick first round of rhubarb, thriving mange tout, redcurrants and blackberries and in-flower tomatoes, raspberries and blueberries are under this mess of ivy and trees and bricks from the neighbours outhouse, and have been, without any light, for a week now. Luckily neither the boy or the puppy where out in the yard when it happens, which is massively lucky as it all fell down about 12.15 last Thursday lunchtime and they usually are outside at that time - If it hadn’t been for the rain they might have been underneath it. And whilst a brick to the head might not have been the worst thing that could happen to the boy, esp. if it knocked his love of football out of his head – but I am not sure the puppy could have withstood it. So, I fear the worst for my plants, and a couple of my 31 things goal. By the time insurance companies and the likes have got themselves involved and that mess has been cleared I imagine they might not have survived & it’ll be far too late to plant anything else. If anyone knows of any foodie plants that prosper well in the gloomy English winter and don’t require planting in the next, well, millennium, please let me know. *I know, last week really wasn’t a great one was it - none gloomy blogging will resume next week – I hope. Blimey that is a bit of a mess, isn't it. What a shame about your veg. As you say though, lucky no one was hurt. We think it was. The ivy was growing on the neighbours side, but had joined up with our tree. The day after he chopped it down, the whole mess came down in our yard - roof tiles and all! i think i might try and get some window ledge planting going on now as we're a bit tight on space. lettuce for sure. mini toms sound amazing too. :( it looks like they fell from a good height too! I'm so sorry to hear about your veggies and plants - I hope it doesn't put you off for next year. yeah - it's pretty high - the rd is on a hill and next door is a lot higher!But I am hoping that once it's cleared it'll mean we can get rid of some of the rubbish plants so I have more room for veg next year!